A lovely unspoilt pub serving good food and a good selection of ales. Both Siren and Tring featured a couple of beers each on the pumps today and they were in very good condition. I last came to this pub about 20 years ago and it hasn't changed that much. It was good then and it's still good now - which can only be a good thing in this age of every pub being given the 'sage green' paint job and losing their uniqueness. 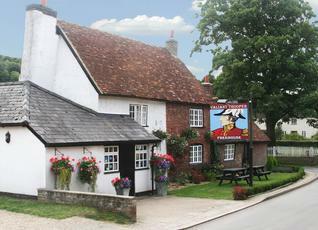 Very nice country pub with a good range of well kept local ales (Tring, Chiltern). Food was good but not great. Very popular on a Saturday lunchtime. The food is excellent. You have to wait a bit, but it is cooked to order. No problem with that. The service was good, friendly and efficient. There were six beers on the pumps on our visit. Fullers London Pride,Tring Side Pocket and Ridgeway. Can't remember the other three. I had the Ridgeway, which was kept very well and served as a full measure. Very nice indeed. A return visit is definitely on the cards. I am awarding a very rare 9/10. Always found the ales to be very well kept and a good range. Whenever I have been in they always have a Tring beer which has been faultless.